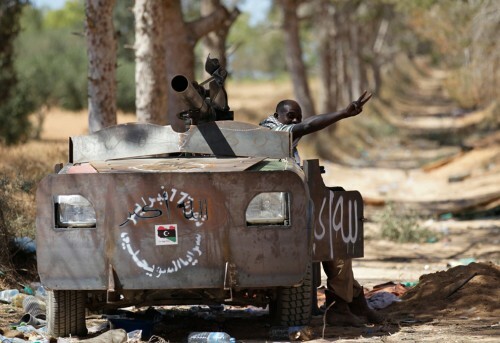 The ingenuity of the the rebels in Libya inspiring. The Atlantic has a set of photos of how the rebels, or insurgents (whatever you want to call them), recycle all sorts of weapons left being by government forces. These rebels can mount soviet era rocket launcher pods that were designed for airplanes and attack helicopters on top of pickup trucks. Some of these pictures are straight out of Mad Max, light weight pickup trucks with heavy armor welded to make Do It Yourself tanks. Today President Obama held a townhall where questions where submitted via Twitter with the #AskObama hashtag. Obama even submitted his own question to his Twitter question and answer townhall hosted by Jack Dorsey of Twitter. Here are some questions that President Obama would never answer. @FrankQuattrone: #AskObama Do you believe prosecutors who intentionally break the law to convict innocent people should enjoy absolute immunity from lawsuit? @dmscott: #AskObama Tech & knowledge industries are thriving, yet jobs discussion always centers on manufacturing. Why not be realistic about jobs? @Nedd8: #askobama Should you be impeached for violating War Powers Resolution by bombing Libya without congressional mandate within 60 days? @lolprez: #AskObama Did Anthony Wiener ever DM you? @iowahawkblog: #askobama I let my Mexican drug lord license expire. Am I still eligible for the free machine gun program? @marychastain: #AskObama Are you aware you’re half-white & your white relatives raised you? @LarrySabato: #askObama If Bush had launched Libyan adventure, wouldn’t Sen.Obama have demanded War Powers Act be obeyed? @DVCfanatic: #askobama Mr. President, are you destroying the economy on purpose or are you really that ignorant when it comes to how the economy works? @JakeShriar: #AskObama What do you plan to do about the fact that foreclosures are still rising? @brotherm4n: #AskObama What about Building 7???? @abuhatem: #AskObama why are we funding the military of South Korea, Japan, Egypt, Israel, Saudi Arabia, and Taiwan? Why can’t they defend themselves? Celebrities often change their name to something more commercial. Jon Stewart was actually born Jonathan Stuart Leibowitz. Some performer go with a nickname or alias that brings in some street cred, such as 50 cents is a better rap name that Curtis Jackson and Prince changed his name to a unpronounceable symbol. Where performers and people are name brands, changing your name can have a similar affect that changing the name of a stadium does. It provides an opportunity to start fresh with a new image. In the sports, there have name a few memorable name changes. Cassius Clay changed his name to Muhammad Ali after converting to Islam. Most recently, Chad Johnson changed his name to Chad Ochocinco. Now, it’s been reported that Ron Artest is considering changing his name to Metta World Peace. According to Wikipedia, Metta means loving-kindness or friendliness. It’s only a matter a time when a top sports figure changing his name to a brand. Can you imagine if Michael Jordan changed to Swoosh Jordan. Now, the best name change in sports was of basketball player Lloyd Bernard Free who changed his name to World B. Free.